Fran Chirico - RRDD1 employee. Fran Chirico is a familiar face to many residents of Barkhamsted and the surrounding area. 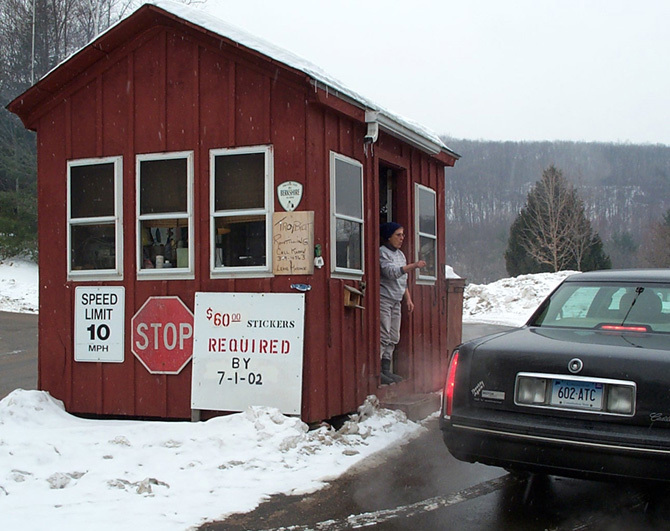 Fran works as the "gatekeeper" at the Regional Refuse Disposal District #1 in Barkhamsted, just off Route 44. Here she greets visitors bringing in their trash and recycling bottles, cans and newspapers. Fran's job is to inspect each vehicle coming into RRDD1 to verify that an up-to-date sticker is pasted on the windshield. She also helps visitors with questions like where to dump that old couch. Because Fran has worked at RRDD1 since 1979 and works just about every day the facility is open (currently Monday, Wednesday, Friday and Saturday) her smiling face and outgoing, feisty personality is well known in the three town area. During her 24 years working at RRDD1 she has seen many changes. Early on the recycling effort was more limited than now. Glass was recycled, with separate chutes for green, clear and brown glass. Tin cans were recycled but not aluminum. 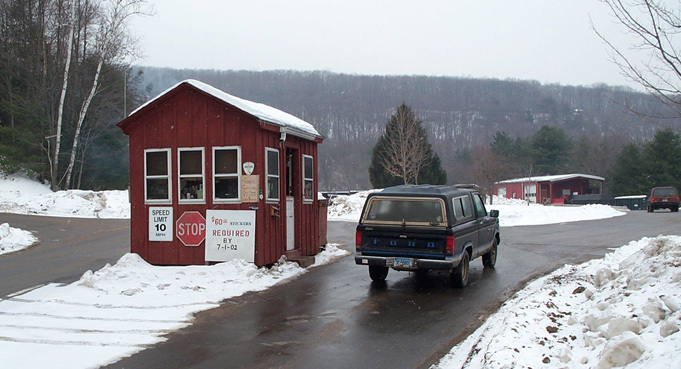 People coming into the facility were not screened to make sure they were residents of the district (which back then included Colebrook). 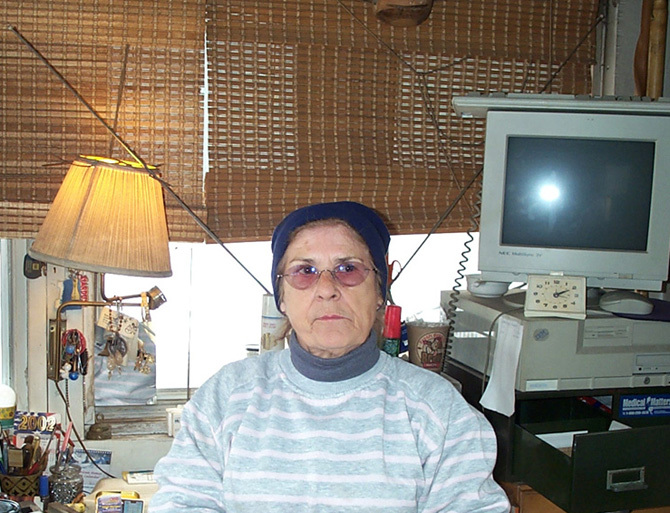 Photo- Fran Chirico, gatekeeper RRDD1 (taken inside the guard shack, January 2003). Now the recycling effort is more robust and visitors are screened. The RRDD1 facility opens at 7 a.m. but Fran arrives an hour early to get things ready for the day. She grabs the wireless phone and some money to make change from the office and starts the wood stove in the gatehouse. The wood burned in the stove is salvaged from material brought in to the facility. The stove keeps the gatehouse toasty even during cold winter days. A typical day in the winter is slower than during the summer. The first hour is fairly busy with most of the traffic going to the upper portion of the facility where construction debris and old furniture is dumped. From 8 a.m. to 2 p.m. the traffic is slow but steady. During the last hour things pick up as people rush in to beat the 3 p.m. closing time. Photo- Cars entering RRDD1 stop check in with Fran before proceeding into the facility. Fran's primary job is to verify that each car entering the facility has a current sticker. Stickers are only issued to residents of the three town district- Barkhamsted, New Hartford and Winchester. The stickers are issued during May or June so at this time of year most people already have them except new residents. Stickers currently cost $60 per year. Fran will answer questions poised by visitors and direct them to the proper location at the facility. Most vehicles head for the lower recycling area where bottles, cans newspapers, magazines, light cardboard and trash are placed. The upper area of the facility handles aluminum, steel, iron, large cardboard and bulky waste. Photo- Fran helps a visitor. Fran will also inspect each vehicle coming into RRDD1 with a quick but practiced scan for items that require fees, such as unusually large amounts of trash ($8 per cubic yard), construction or demolition material ($25 per cubic yard), stumps or other pieces of large wood ($12 per cubic yard), tires ($2 each- more for truck tires) and appliances that contain freon ($15). Fran is well aware that some people will try to sneak these items in without paying the fee. When these items are spotted, visitors will find that Fran is a tough negotiator who has heard it all. For example, a visitor may suggest that the fee should be waived because these "valuable" items are being generously donated to RRDD1 for resale. But Fran is not buying that line as she prepares the paperwork for the fee. Fran enjoys the job, especially the customer contact. "I get to see everybody and it doesn't get boring, there is just enough traffic to keep me busy and in good humor" she says. Sometimes the customer contact can be stressful as some people react with anger over sticker fees or the cost of dumping certain items. Fran can tell stories of some of the more extreme encounters over the years involving very difficult people and sometimes requiring police assistance. Payment of the fees is not always popular, but as Fran points out, "where are you going to get something for free"?